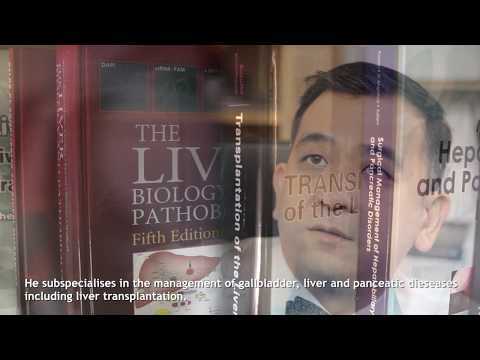 Adj Associate Professor Stephen Chang is the founding President of the Hepatopancreatobiliary Association of Singapore. He graduated with MBBS in 1994 and obtained his Master of Medicine in Surgery in 2000 from the National University of Singapore and having obtained his Fellowship in Surgery from the Royal College of Surgeons of Edinburgh in 2003, went on to further training in Laparoscopic Hepatobiliary and Pancreatic Surgery and Liver Transplantation in Paris, France. He is a key developer of the laparoscopic approach to Hepatobiliary and Pancreatic Surgery in this region and is also active in developing the Living Donor Liver Transplant Program in Singapore. He is the pioneer of the Single Incision Laparoscopic Surgery and was the first among the first in the world to publish his experience in single incision laparoscopic gall bladder surgery, liver resection and pancreas resection. To date, he has more than 500 patients operated through this technique and is actively sharing his expertise in the region and world-wide. Academically, A/Prof Chang has several research interests involving not only clinical research but also basic science and Medtech development. He is presently holding/ held numerous research grant awards totally more than S$7 million to develop new surgical techniques and treatment modalities through medical technological initiatives. He has almost a hundred publication in both clinical and Medtech research and has since filed five patents in these areas. With these endeavors, he hope to contribute towards improving the care of our future patients. Cryopreserved cadaveric vascular grafts: Studying the long term effects of Cryopreservation (2007 – 2012) (S$166,000.00), NMRC New Investigator Grant. Principal Investigator. Development of an Ablation and Division Device with blood- flow sensor feature (10/7/2008-31/7/2010) (S$150,000.00),NMRC Exploratory/ Development Grant. Principal Investigator. Liver progenitor cells in chronic liver injury – a potential source of autologous cells for liver tissue engineering (S$124,000.00), NMRC New Investigator Grant. Co-Investigator. Characterization of anisotropic healthy, pathological and ablated liver tissue using quantitative MR elastography (S$68,000.00), JSPS-NUS Joint Research Project. Co- Investigator. Epigenetic Approach to Treating MYC-driven Hepatic Tumors – (1 Mar 2015 -28 Feb 2017) ($150,000.00), Seed Fund for Basic Science Research Grant.